Organically grown tomatoes are more nutritious in some ways than the conventionally grown variety, a new study from Brazil suggests.The results show that organically grown tomatoes, while smaller, have higher levels of vitamin C as well as more plant phenols, a class of compounds that act as antioxidants, than do conventionally grown tomatoes. The organic variety might also taste slightly different, as they have higher levels of sugar, although this new study did not assess taste. The findings contradict those of research published last September in the journal Annals of Internal Medicine, which reviewed more than 200 studies and found no difference between the vitamin contents of organic and conventional foods. However, another review, published in 2011 in the Journal of Agricultural and Food Chemistry, concluded that organic crops tend to be higher in vitamin C and phenols, and lower in protein, than conventionally grown crops. Experts say there’s still not enough evidence to recommend that people eat organic foods solely for their nutritional content, said Gene Lester, a plant physiologist for the Agricultural Research Service of the U.S. Department of Agriculture in Maryland, who was not involved in the new study. Indeed, researchers have yet to examine whether the nutritional differences between organic and conventionally grown foods actually translate into health benefits, Lester said. However, consumers may still wish to buy organic produce for environmental reasons: organically grown foods have a lower carbon footprint and use fewer pesticides. Recently, the American Academy of Pediatrics said it’s important for children to eat a diet that’s high in fruits, vegetables, whole grains and low-fat dairy products — regardless of whether these foods are organic or conventionally grown. Organic produce tends to be more expensive than traditional produce, and not everyone may be able to afford it. The researchers of the new study hypothesize that organic foods contain higher levels of certain nutrients because these foods are grown under more “stressful” conditions. The plant’s response to this stress leads to increased production of certain compounds, including phenols. Lester agreed, saying that one of the main stressors of organic crops is the type of fertiliser used. Organic crops must be grown with organic fertilizers, such as decayed plant matter, which release nitrogen more slowly than do synthetic fertilizers. This slow release of nitrogen, a nutrient the plant requires, puts the plants under greater stress, Lester said. Harry Klee, a professor at the University of Florida’s Horticultural Sciences Department who was not involved in the study, said the organic tomatoes in this study might have had more nutrients not necessarily because they were grown organically, but because they were smaller. 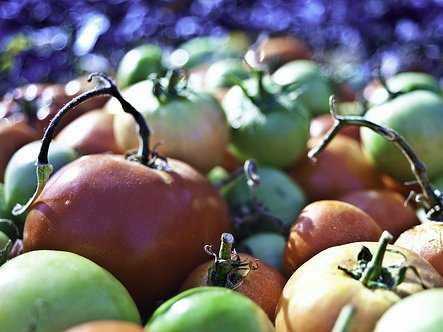 A tomato plant only has so many nutrients and flavour chemicals to go around, and a plant that has smaller fruit is better able to fill each tomato with nutrients than a plant that bears a larger fruit, Klee said. The new study, conducted by researchers at the Federal University of Ceara in Brazil, is published today (Feb. 20) in the journal PLOS ONE. Pass it on: Organic tomatoes have more vitamin C and plant phenols, but it’s not clear whether eating them instead of conventional tomatoes would provide more health benefits. Follow Rachael Rettner on Twitter @RachaelRettner, or MyHealthNewsDaily @MyHealth_MHND. We’re also on Facebook & Google+. 9 Snack Foods: Healthy or Not?